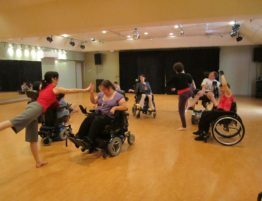 Our annual Body Shift mixed-ability dance weekend is coming up Oct. 5-7th. We are seeing registrations come in, but as has been in the case in past years, I am not seeing my fellow trained dancers sign up- at least not very many. I think I need to say something…something that has been on my mind for years now. 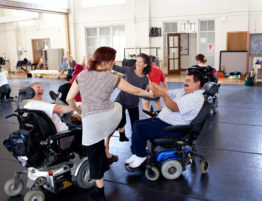 Able-Bodied Dancers- YOU ARE MISSING THE BEST DANCING IN AUSTIN!!! 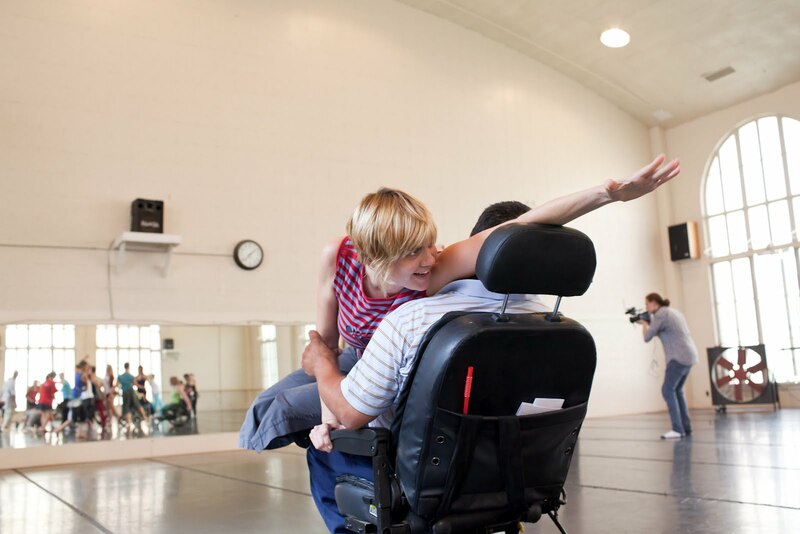 I think many able-bodied dancers hear “mixed-ability” dance and feel terrified. We hear- people with disabilities- people whose bodies are different and move different than mine- and we 1. feel bad, 2. feel worried, and 3. feel scared. We don’t think there is a place for us. We don’t know how to behave. We don’t know how to interact. Or what to say. Will this be boring? Will I fit in? We are afraid. I have always said…put a bunch of people (primarily women) in tight-fitting clothing and stand them in front of mirrors and them fill the room with competition and anxiety and see what you get….It’s AIN’T PRETTY!!!! It’s not our fault. We didn’t ask for it. But we get hung up. 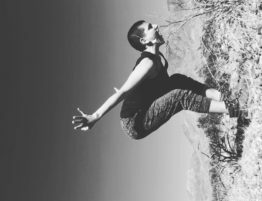 Hung up about our bodies and how we look and move and then how YOU look and move. And we are hard on each other but even harder on ourselves and then you are going to ask us to come and dance with someone who has no legs or is blind or uses a wheelchair or has a nerve condition and can’t walk….HELL NO!!! But…you know what friends. It’s fun. IT’S THE BEST DANCING IN AUSTIN. I TELL NO LIES! For me, I get to be in my body in a different way when the room is full of people who don’t move like me and don’t look like me. I find it richer, more interesting…making connections happen in unexpected ways. I learn something every time. I have to slow down, sometimes speed up, solve “problems” in new ways. Try things I haven’t before. My brain is stretched. My body learns…and IT IS REALLY REALLY FUN! 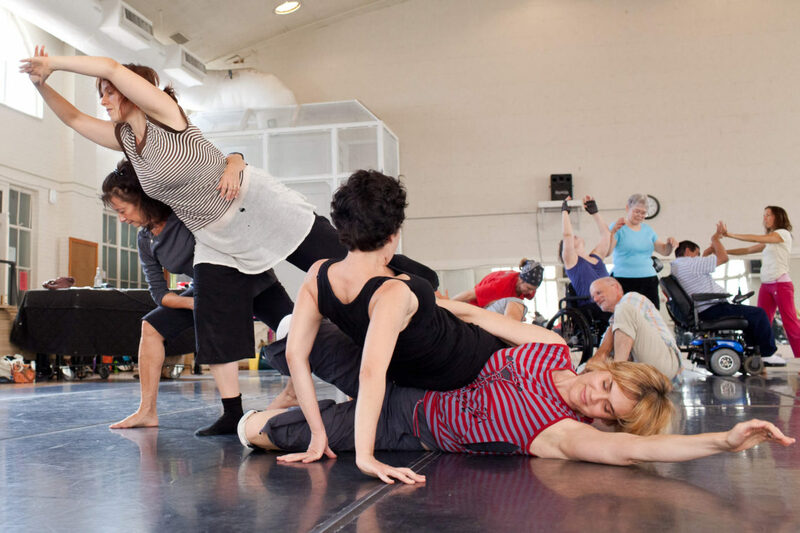 My good friend Julie Nathanielsz wrote this about why Body Shift is the best dancing for her. She sums it up really really well. 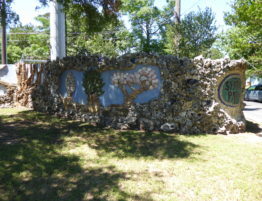 And, after reading this you can learn more and sign up here. Now you don’t want to miss the best time you will ever have dancing, do you?? ps- Photo shows me and Juan Muñoz “dueting”. Looks like fun, no?? When I started giving integrated classes a few years ago, I wasn’t sure if it was for me. A great initiative I could get behind intellectually, but as a context for dancing? Yet every occasion I attend or teach a class, radical things happen: moving relationships that defy expectation and render my powers of anticipation useless; the appearance of small or significant contrasts that subsequently play teacher. 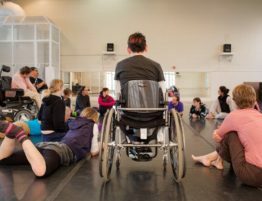 For me integrated dance is not about resorting to the lowest common denominator (a prevalent understanding in my experience) – it’s about inviting our internal authority as dancers, finding ourselves at home in the body, while in ensemble.